My course results for L192 and the excellent LXR122 should be out tomorrow. The courses are like driving tests, a straight pass/fail (with the possibility of a distinction). There is a possibility of a distinction for me in L192 given that 85% is needed and that my coursework average is 92.3%. 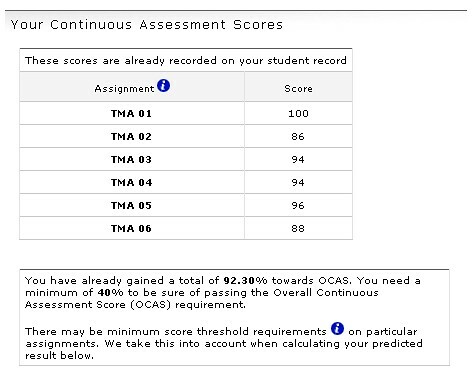 The first end of course assessment should be okay (it's essentially the sames as the TMA, teacher marked assessments). ECA2, the oral, might have let me down a bit... but I do have some safety margin. LXR122 I'm less worried about as a course as it does not lead to anything, per se. L192 on the other hand leads to LZX120. However I would be disappointed not to do well. The assessment here consisted of an oral and an essay, both in French. The essay was only 300 words, but that was enough. In the oral I had to give a presentation on a topic of my choice for a few minutes, and then I was asked questions about it. Both had to be based on France. In the oral I discussed how Grandad was captured on his way to Dunkirk and then marched across France to a POW camp in southern Germany. In the essay I wrote about the Eiffel Tower.